The salmon-farming industry, which has grown at breakneck speed since the 1970s, knows it has a huge problem, but insists it sees the lice as unwelcome guests that will soon be evicted rather than permanent residents. Rather than dwell on the lice, industry leaders point to the fact that in just 40 years, aquaculture has gone from providing 5% of the world’s fish to nearly 50%, and in Scotland, from a few hundred tonnes of salmon a year to more than 177,000 tonnes in 2015. They argue that new methods to control infestations are being developed and the chemicals being used are safe and degrade quickly, adding that they expect to have found a solution within a few years. I last heard Staniford talk in London in 2012, when he gave a lecture at the National Geographic Society, calling fish farms “toxic toilets” and warning that diseases were rife, waste was out of control and the use of chemicals was growing fast. Not only were fish farms getting bigger, he said, they were also becoming reservoirs for infectious diseases and parasites. It was a shocking, revealing talk. I did not know that farmed salmon were fed partly on fishmeal and fish oil, often derived from ocean fish such as anchovies, herring and sardines. Despite industry claims that industrial aquaculture feeds the world’s poor, it seemed that the big farms were adding to the pressure on the depletion of the oceans. This week I asked Staniford what had changed since then. Little, he replied, except that the farms had got bigger, the industry was spending even more heavily to control the lice, more fish were dying in appalling conditions and the pollution caused by their waste and the use of chemicals was becoming more serious. He has spent the past five years labelled an “eco-terrorist”, a “troublemaker”, an “exaggerator” and “a prophet of doom”. He has been sued by the industry for defamation, lost a high-profile Canadian high court battle, been heavily fined, been threatened many times, and been ordered never to repeat statements such as “wild salmon don’t do drugs” and “salmon farming spreads diseases”. “He is an ace troublemaker. He annoys everyone … but he uses freedom of information requests to get his data and 99 times out of 100 he is right”, says Scottish investigative journalist Rob Edwards. “I am a trained scientist. I use peer-reviewed science and use the industry’s own figures,” says Staniford. “What we are seeing now is a chemical arms race in the seas, just like on the land farms, where the resistance of plants to chemicals is growing. In fish farms, the parasites are increasing resistance to chemicals and antibiotics. There has been a 10-fold increase in the use of some chemicals in the past 18 months.” The farms are now turning to mechanical ways to delouse the fish, he says. “They are using hydro-dousers, like huge carwashes, and thermal lousing, which heats them up.” There is also the spectre of GM salmon, with companies engineering GM plants for their omega-3 to feed the fish, and a US company given permission to develop GM salmon. 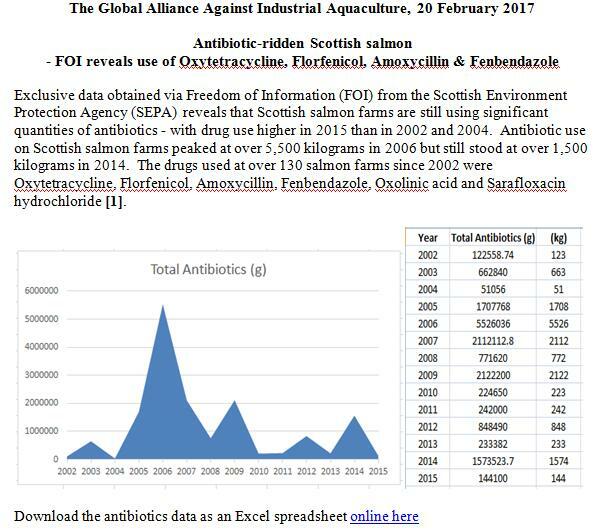 Meanwhile, FoI documents obtained by Staniford show that the Scottish industry wants to “innovate” by building the world’s biggest salmon farm, which would triple the size of the largest now in operation. It could farm 2m fish at a time, and create as much waste as a city the size of Glasgow. “It would be an ecological disaster,” says Staniford. Salmon retail prices set to leap owing to infestations of sea lice. The answer to the inevitable lice problems, say environmentalists, is to move the farms further offshore into deeper, colder waters, where lice are less able to survive, or to even put them on land, where they could be better controlled. But this would add greatly to industry costs and require investments of billions of pounds. In the meantime, the companies are using mechanical ways to trim the lice from the fish. These range from pumping the fish through water hot enough to make the lice let go of their hosts, to churning them as if in a washing machine. Both are condemned by animal welfare group Compassion in World Farming, and are known to be expensive and not always effective. Last year the heating of the water on a Skye fish farm led to the accidental slaughter of 95,000 fish. Another 20,000 died in another incident. The smart money is now on breeding wrasse, a small fish that eats lice. It is being widely piloted and is highly promising, says Landsburgh. “We have about 100,000 fish and the wrasse have cut our losses enormously. We haven’t had to use chemicals since August 2014. Most fish farms are overcrowded, but we are not. We find lice very occasionally but 99% of the time we are completely clean,” said Pete Robinson, a worker at the Wester Ross salmon company in Ullapool. But even using wrasse is not a complete answer. New scientific studies showed this week that fish farms may be depleting wild wrasse numbers too, and to breed enough for all Scottish farms could take four or more years, says Landsburgh. “But we have to keep at it. The louse is a hardy parasite. We are doing our damnedest to eradicate it,” he said. • Farmed salmon is still good for the health. Buy from the smaller, sea-based farms that are not under pressure to overstock. There are a few good organic ones that claim to have addressed all the problems. People have to judge carefully the environmental and health issues. The good news is that both farmed and wild salmon have very low levels of mercury, PCBs and other contaminants.